Humanity is capable of such. She is NOT a canabal as she was never shown eating HUMANS. While technically a valid point, I think that the point made about murder suggests that a slightly different interpretation is required*. To wit, I agree that (via the "enlightened POV" of Burnham) we are supposed to see it as an example of the MU's depravity, however IMO the deciding morality on the question should be the Kelpians, who in both the MU and regular universe regard themselves as prey and therefore "fair game" as food. * NB The English common law definition would pretty much work: when a person, of sound memory and discretion, unlawfully kills any reasonable creature in being and under (the king's) peace, with malice aforethought, either express or implied. Back on topic. How it should work. I don't think S31 should be shown as a collection of just sociopaths and psychopaths that break the rules because they can. We should get some consiencius members who do stop and think and try playing things by the rules first, only breaking the rules after a lot of thought. Also if they do something really bad, sure it should fix the problem short term but it should generally have long term negative effects. MU Georgiou is someone who believes in the need for strength, and stepping on everyone else in order to survive. She also believes that unity and camaraderie are weaknesses. To her, this makes sense given her environment. I don't think the show will be about the audience becoming soft on Georgiou, I think the main arc/premise is going to be Georgiou learning to believe in the Federation. I don't know how many of you have read Iain M Banks' culture novels, but the character that goes by the name of Zakalwe comes to mind. A redemption arc perhaps. She seemed evil but not as evil as others from that universe, like Tiberius or the Intendant. Yeah she only exterminated the Klingon homeworld and billions of their race. No biggie. What did Mirror Kira do? Run a slave labour camp? Mirror Klingons. No one cares about them. Perhaps not the viewers, but in-universe lives are lives. Is Vader redeemable? If so, what makes him different from Georgiou? I don't want this show, but I do like the actor. I'd rather have a prequel Captain Georgiou show after Discovery, show why she is on a list of legendary captains...The idea of a Section 31 show is weird, they're already in a dodgy area with Star Trek, to make a show about them is a bit off. We have no idea if Georgiou is the "hero" and let's not conflate "hero" and "protagonist." Also, Anakin Skywalker is supposed to be the hero in the PT and inform the audience's view of him as Darth Vader. Why does hero status change a redemption possibility? ...The idea of a Section 31 show is weird, they're already in a dodgy area with Star Trek, to make a show about them is a bit off. Some things are beyond forgiveness. I would consider genocide and eating the flesh of sapient beings to be examples of such. YMMV. As for whether they're going to try and redeem Georgiou or what form the series will take, it's too early to know. It is far too early to know. But Vader did worse than genocide. But, his return to the light is the highlight of an entire film! Plus, Anakin is the hero, even though we know the outcome and his eventual turn to evil. I'd say there's a fundamental difference between the world of Star Trek and Star Wars in terms of how they treat characters. Star Wars has always been a story about a very small amount of larger-than-life, heroic (and villainous) characters who destiny has propelled to greatness. 99.99999% of everyone else in the Star Wars universe - including entire planets - don't really matter to the narrative one bit. 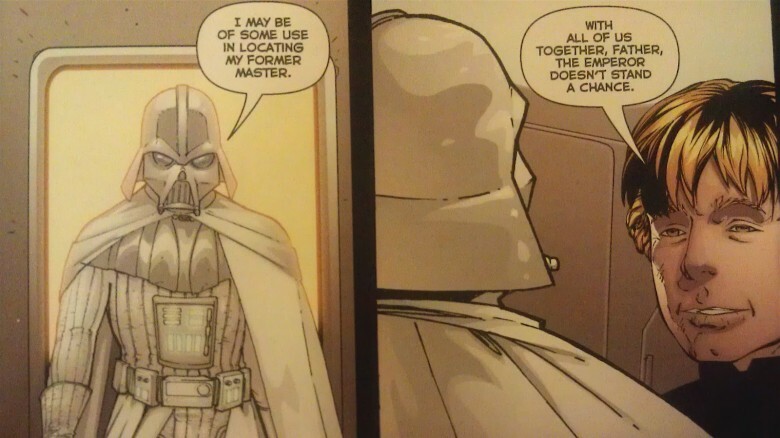 This allows for Vader's redemption arc, because we're never supposed to take seriously his actions towards anyone who is not a named character in the series. All the other bad stuff he does is just signaling to the audience to let us know how EEVILL he starts out as being. In contrast, Trek is not the heroic monomyth. It's fundamentally a story about ordinary people - mostly professionals - working together as a team to confront problems. It's also I would argue fundamentally a setting where free will, rather than destiny, is lauded. Very much an "enlightenment" kinda show, not a romantic one. While I would argue that the idea that some acts are so bad that someone is literally beyond redemption is very un-Trekkian. At the same time, I don't think Trek would ever have a shallow heel-face turn like Star Wars - where saving your son cancels out the death of thousands. You need to do more than that to earn redemption. Hell' Damar - who got the best heel-face turn in Trek - had a long path to "redemption" - and ultimately still got his comeuppance by dying. It is far too early to know. But Vader did worse than genocide.